Dvojice buřičů z 7 500 kilometrů vzdáleného sibiřského Irkutsku míří do Brna a Prahy, aby pověděla, čemu je naučily nedávné brutální policejní represe. Představí nám politickou realitu sibiřské periferie a nových protiteroristických zákonů. Vysvětlí, proč anarchisté v současném Rusku nesdílí naděje liberální opozice po největších protestech od moskevských nepokojů v roce 2012 a sdělí nám svou odpověď na dědictví totalitní mentality všudypřítomného strachu. 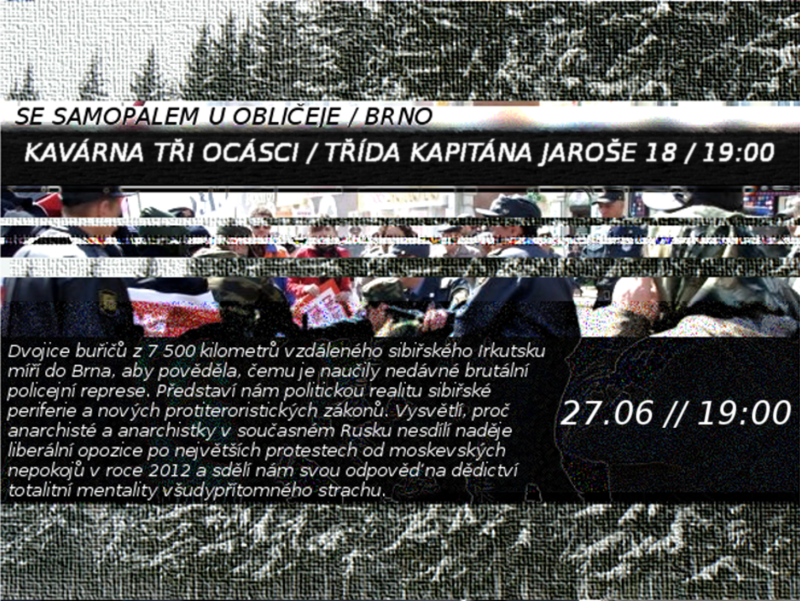 Praha: Autonomní sociální centrum Klinika/Black Books Infoshop/ Jeseniova 60 // 28.06/ 18:30 psaní dopisů anarchistům do ruských věznic, 19:30 večeře, 20:00 přednáška, 21:30 Trouble: Uprchlíci vítejte! Třetí díl dokumentárního pořadu, tentokrát o hranicích a lidech, které je rozdělují. It was quite clear, that releasing Lukáš Borl from the prison doesn’t mean the end of another continuing of Fenix operation. More precisely Fenix 2 (The case of Lukas Borl). One of the charges brought against Lukáš is establishing, supporting and spreading a movement leading to suppressing human rights and freedoms. But the police will have kind of a hard time to prove existence of a group, where ther is only one person. Even for terrorism are needed at least three people, every newbie at the police academy knows that. And members of police units are not counted as part of the group! And so genius idea was born and it was clear that at least the second episode of Fenix needs a better reputation. After “unbiased“ judge in Fenix 1 ( the entrapment case where five anarchist facing charges for a “terrorist attack” against the train with military equipment in a state of preparation), who worked 13 years for ÚOOZ (the same unit who infiltrated and later arrested the group), would love to shoot refugees, hates Roma people and very probably women too, and after embarrassing apology from the Ministry of injustice to Igor after Igor was found “innocent” by the supreme court two weeks ago (doesn’t mean much, he still faces the deportation procedure), would policemen look like total losers if they kept claiming that Borl supports movement consisting of himself. So the police shifted up a gear and came up with a plan. Into Fenix 2 were added four more people. On June 9th the police launched a prosecution against 3 aanarchists and one environmental firebrand, all charged with 16 felonies in total. Those 68 pages of accusation almost sound like a stupid joke if we consider that charges are based on who may wrote what on the internet some years ago, what kind of literature was kept at home or what does he thinks. But unfortunately we know that this is only another repression from the police and those five fellow troublemakers persecuted in Fenix 2 (Lukáš plus four new ones) face bullying, have to search for lawyers and can end up in jail and that’s where the “fun” stops. We are actually not kidding at all. 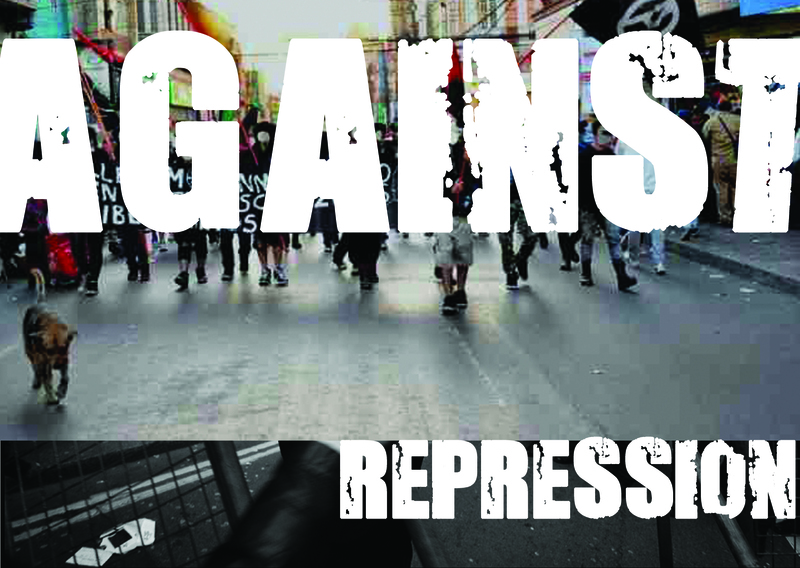 After sentence in Aachen, few days ago, against anarchist who was sentenced to 7,5 years, are these accusations showing again and again that any kind of apology from the ministry of justice (as they just sent to Igor) is only a strategic move to legitimize another repression, control and bully. But no state will ever get our legitimacy. anarchist sentenced in Aachen and all the other rebels behind the bars. With desire for freedom in our hearts.